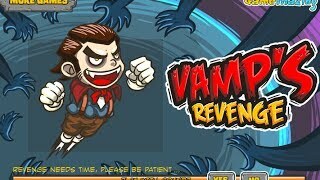 Click on the Play Button and 'Vamp's Revenge' will start after this message... Thanks for waiting! Help Santa jump on his helpers while he gets dessed and picks up the presents he needs to deliver this Christmas. Are you ready to face some creepy creatures and scary monsters? Do not be scared! Man up and fight off these malevolent forces! Blast those skull with your shiny bazooka. Pyro, the little flame, feels a burning love for the Paper Princess. He will do what it takes to convince her their love does not have to end up in tears. Jump on the wheels and try to catch the princess in 100 stages full of obstacles. Collect all the flames! Enjoy this sequel! Throw tadpoles and hit the demon blocks in order to make them fall off the platforms. Put an end to their threat on this Halloween day! Enjoy this rather raw new version of classic Paperboy that takes place in Halloween. Ride your bike around town and deliver your pumpkins! Crash as many windows as you can, collect coins and dodge the obstacles. Spend on upgrades for your bike! Good luck, you punk! Enjoy this new version! Help the crazy gran escape from the asylum in which she's locked during Halloween, the spookiest season! Dodge obstacles, jump, slide and collect as many coins as you can. Don't get caught! Fun game, but a few issues. First is the invisibility frames when getting hit. It doesn't work all the time meaning that if you touch an enemy during battle mode, you'll lose your hearts rapidly without a chance to recover. Next is once you beat the game, it doesn't allow you to upgrade anything afterwards making the other achievements impossible to get. Reloading the game fixs the problem.